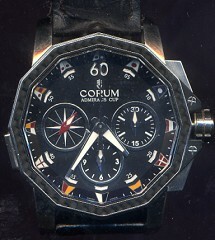 Corum SS Admiral's Cup Challenge 44 Split-Second Chronograph! Desirable & EXTREMELY RARE Corum split-second Corum Admiral's Cup Challenge 44, carbon fiber bezel, carbon fiber inserts in chrono & split-second pushers, SS, reference 01.0035, automatic movement, split-second, 10 ATM water resistance, chronograph. Limited series 443 of 1000! Size is near 51 mm with lugs x 44 mm! Last retail was approaching $15,000 or more...Sell for $6,750 or TRADE!